Is the drug industry "stopping dementia in its tracks" or in actual fact "running out of steam"? Sometimes you have to trust people to get on with things. That’s why headlines saying fracking under homes could go ahead without permission don’t help. And the reported assimilation of ‘caredata’ into the NHS information “borg”, without clear valid consent, is running into problems. We cannot sign off every single decision about how each £ is spent in the ‘fight against dementia’ as it’s called. But the issues about care vs cure in dementia is running into the same problems with imbalance in information as fracking and care data. This threatens seriously to undermine trust in policy leaders supposedly working on behalf of us in tackling dementia. 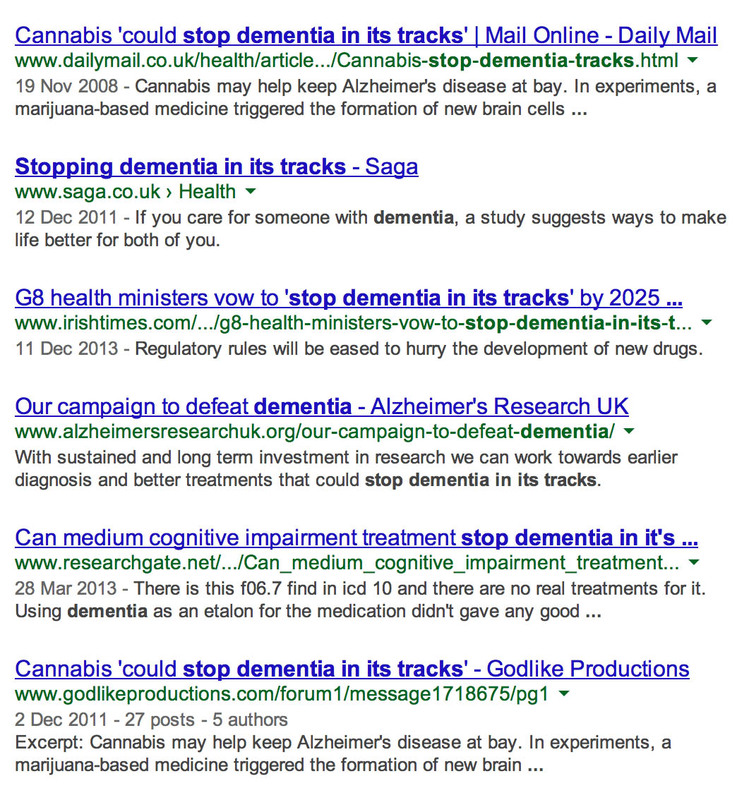 The origins of the phrase “stopping dementia in its tracks” are obscure. Stopping something in its tracks may be somehow related to the phrase “running out of steam” for nineteenth century railway trains “running out of steam”, or coming to a sudden end when travelling. Is the drug industry “stopping dementia in its tracks” or in actual fact “running out of steam”? To stop something in its tracks, nonetheless, is a popular metaphor, as it tags along with the combattive ‘war’ and ‘fight’ against dementia theme. While there’s been a need to focus on bringing value to lives with dementia, much of the fundraising has involved painfully pointing out the costs. A study conducted by RAND Corp. for the federal government earlier in 2013 found that nearly 15% of people ages 71 or older, or about 3.8 million people, now have dementia. Each case costs $41,000 to $56,000 a year, the study found. By comparison, direct expenses in the same year for heart disease were $102 billion. The study also tried to get a handle on the cost of informal care, which is often provided by family members in their homes. It pegged that cost at a range of $50 billion to $106 billion a year. In a press release dated 24 January 2014, the Alzheimer’s Society and Alzheimer’s Drug Discovery Foundation (ADDF) are reported in their “Drug Discovery Programme” as offering up to $1.5 million to new research projects which could speed up developing treatments for Alzheimer’s disease (AD) and dementia. It is hoped that international collaboration could help make the hope of finding effective dementia treatments within the next ten years a reality. This call is open for research looking at all forms of dementia including Alzheimer’s disease. This international call for research proposals comes just weeks after the G8 Dementia Summit in London called for more global collaboration in dementia research in order to develop effective treatments by 2025. It is described in this promotional video as “halting dementia in its tracks”. To “halt something in its tracks” literally means “stop (dead) in something tracks to suddenly it stop moving or doing something”. A previous research grant from the Alzheimer’s Society looked at fruit flies. It was for Dr Onyinkan Sofola at University College London for £208,277. It started on October 2007 and was completed on September 2010. The researchers developed a fruit-fly model of Alzheimer’s disease where the flies accumulated amyloid, and investigated the involvement of “GSK-3” on the behaviour of the flies. It was hoped that dialing down GSK-3 in healthy flies also did no harm suggesting this approach could work as a safe therapy for Alzheimer’s disease in humans. Ahead of the G8 Dementia Summit in London last year (11 December 2013), Professor Simon Lovestone, Institute of Psychiatry, but soon to be at Oxford, set out what he hopes the Summit will achieve, the challenges of developing new therapies for dementia, and the real possibilities of one day preventing this devastating disease. 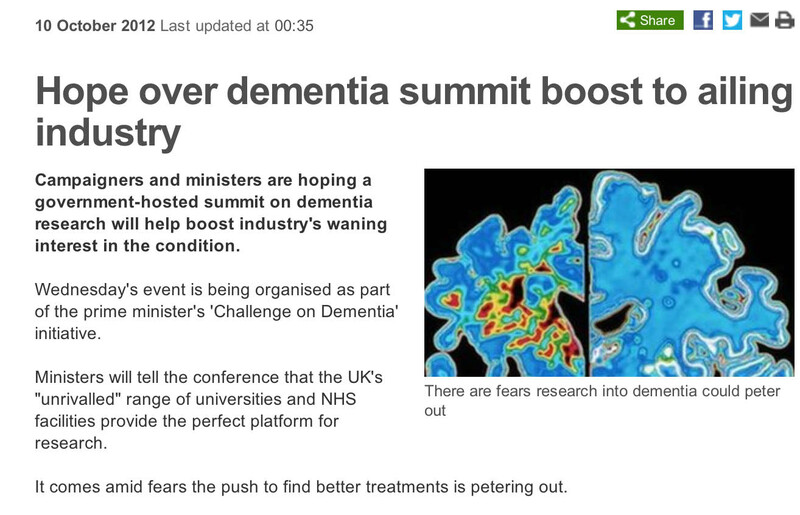 The Summit was supposed to bring together Health Ministers from across the G8, the private sector and key international institutions to advance thinking on dementia research and identify opportunities for more international collaboration, with the ultimate aim of improving life and care for people with dementia and their families. Drugs currently used to treat Alzheimer’s Disease have limited therapeutic value and do not affect the main neuropathological hallmarks of the disease, i.e., senile plaques and neurofibrillar tangles. Senile plaques are mainly formed of beta-amyloid (Abeta), a 42-aminoacid peptide. Neurofibrillar tangles are composed of paired helical filaments of hyperphosphorylated tau protein. New, potentially disease-modifying, therapeutic approaches are targeting Abeta and tau protein. Drugs directed against Abeta include active and passive immunisation, that have been found to accelerate Abeta clearance from the brain. The most developmentally advanced monoclonal antibody directly targeting Abeta is bapineuzumab, now being studied in a large Phase III clinical trial. In the 1980s, the amyloid cascade hypothesis emerged, and it was the most long considered theory. It is based on the β-amyloid overproduction as responsible for the senile plaque formation and for the neurotoxicity that leads to the progressive neuronal death. However, controversial data about if β-amyloid is the cause of the disease or one of the main risk factors for AD are reported. A further postulated theory at the end of the past century was the tau-based hypothesis. It is based on aberrant tau protein, a microtubule-associated protein that stabilizes the neuronal cytoskeleton, as the origin of Alzheimer’s pathology. There have been two phase IIb clinical trials with two different compounds, tideglusib and methylene blue. Both compounds have reported some positive results in the increase of cognitive level of AD patients after the first treatments on phase IIa clinical trials. In the meanwhile, intensive research on the physiology and pathology of tau protein leads to the discovery of two kinases responsible for its posttranslational aberrant modifications. After cloning, these kinases were identified more than ten years ago, including the now well-known glycogen synthase kinase 3 (GSK-3). The excitement of this “GSK3 hypothesis of Alzheimer’s disease” is described here in this paper with Professor Simon Lovestone as last author. But all may not be as well as it first appears. GSK-3 inhibition may be associated with significant mechanism-based toxicities, potentially ranging from hypoglycemia to promoting tumour growth. But encouragingly, at therapeutic doses, lithium is estimated to inhibit approximately a 25% of total GSK-3 activity, and this inhibition degree has not been associated with hypoglycemia, increased levels of tumorigenesis, or deaths from cancer. Currently it’s hoped, in pathological conditions, the GSK-3 inhibitor would be able to decrease the upregulation of the enzyme and, in the case that this treatment would slow down the GSK-3 physiological levels, other compensatory mechanisms of action would play the restorative function. Therapeutic approaches directed against tau protein include inhibitors of glycogen synthase kinase- 3 (GSK-3), the enzyme responsible for tau phosphorylation and tau protein aggregation inhibitors. NP-12, a promising GSK-3 inhibitor, is being tested in a Phase II study, and methylthioninium chloride, a tau protein aggregation inhibitor, has given initial encouraging results in a 50-week study. Fingers crossed. Another important challenge for a GSK-3 inhibitor as an AD treatment is its specific brain distribution. The drug needs to cross the blood-brain barrier to exert its action in the regulation of exacerbated GSK-3 brain levels. Usually this is not an easy task for any kind of drug, moreover when oral bioavailability is the preferred administration route for chronic dementia treatment. And once it gets into the brain, it has to to go to the right parts where GSK-3 needs to be targeted, not absolutely everywhere, it can be argued. Nonetheless, the enthusiasm about the approach of drug treatments is described on Prof Simon Lovestone’s page for the Alzheimer’s Society. However, Professor Lovestone’s research group has run into problems when trying to demonstrate their findings in mice, an important step in the research process. The problem is that mice do not naturally develop Alzheimer’s disease, and it is even difficult to experimentally cause Alzheimer’s disease in mice. We may soon have to face up to the concept, with the current NHS having to do ‘more with less’, and ‘with no money left’, ‘we can’t go on like this’. It would be incredibly wonderful if you could give an individual a medication which could literally ‘stop dementia in its tracks’. But even note the scientific research above is for Alzheimer’s disease, one of the hundred causes of dementia, albeit the most common one. Or we may have to stop this relentless spend on finding the “magic bullet” in its tracks, and think about practical ways of enhancing the quality of life or wellbeing of those currently living with dementia. Nobody reasonable wishes to snuff out hope for prevention or cure of the dementias, but, for a moral debate, the facts have to be on the table and clear. Every money we spend on investigating magic bullets which don’t work could have been spent in giving a person living with dementia adequate signage for his environment, or a ‘memory phone’ with photographs of common contacts. But the drug industry, and the people who work with them, never wish to admit they’re running out of steam.